Fundraising events are as diverse as the causes they benefit. On Mightycause, we’ve seen everything from marathons and 5ks, bicycle races, dance-offs, read-a-thons, galas, and beyond. The Mightycause platform is flexible enough to host any kind of event. We’ve built in options that allow you to customize your event so it operates the way you want. And now, we’re making it even easier to run an event by introducing event registration. There’s a reason event planning routinely ends up on lists of the most stressful jobs in the United States. It requires a lot of effort, keen attention to detail, and an understanding of everything from marketing to getting the right permits. Our goal at Mightycause is to make planning and running your event easier. And that means providing you with an event fundraising platform that’s easy to use and keeps all your event data in one place. Event registration allows you to manage the people coming to your event, fundraisers, and donors all on the same platform. Event fundraising isn’t easy. And it probably never will be. But event registration on Mightycause allows you to streamline event management, while engaging more people and raising more money for your cause. Eventbrite is the leader in online event registration. Their platform is user-friendly and built to handle all kinds of events. So, rather than reinvent the wheel, we decided to stick with what works. 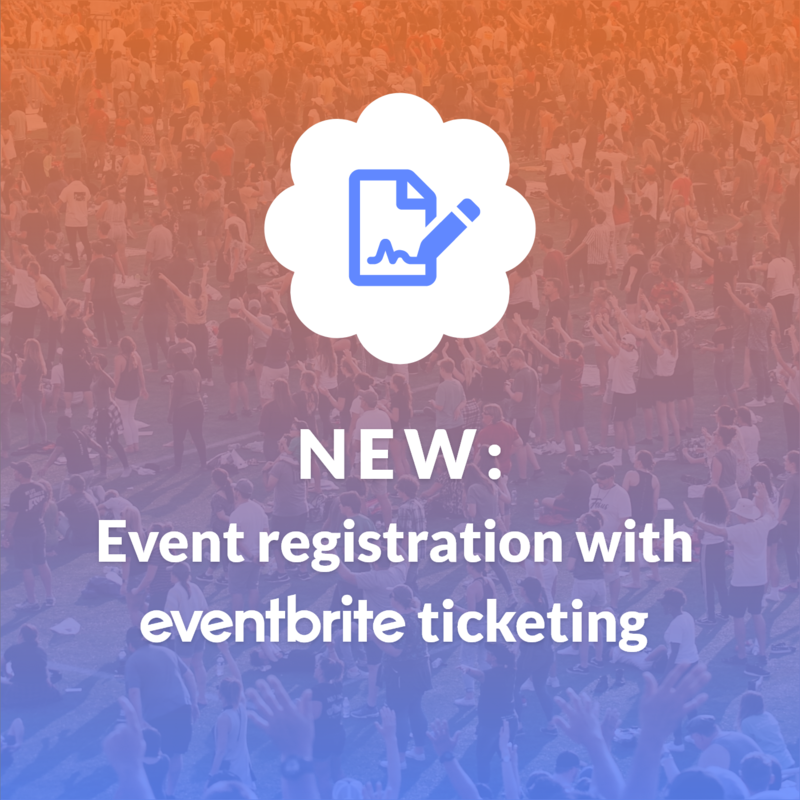 We’ve integrated Eventbrite into our event fundraising platform, so you can register attendees for your event, sell tickets, and seamlessly incorporate peer-to-peer fundraising in your event. Eventbrite Sync: You will never have to copy over information from Eventbrite or double your work — we’ve got you! Mightycause syncs to your Eventbrite event, so we just pull over the data we need to help you run your event. Attendee Management: Whether someone is signed up as a fundraiser or just registered to attend your event, you can easily find their information, track them, and contact them through Mightycause. Attendees are synced from your Eventbrite page, so there’s no need to bounce back and forth between websites to keep track of your attendees! In-App Attendee Messaging: Want to email your attendees? Or share tips with attendees who are fundraising for your event? Need to communicate some parking information, or nudge along a few fundraisers who need help with their fundraising pages? Mightycause allows you to message your event attendees through the platform, making communicating easier than ever. To Fundraise, or Not to Fundraise? 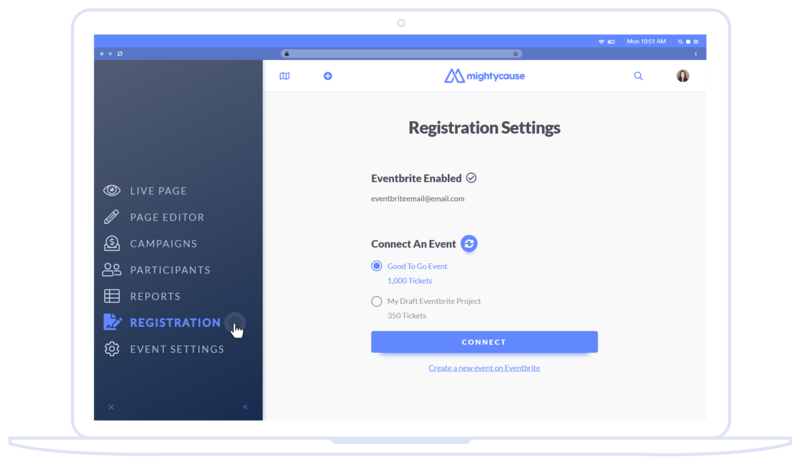 Mightycause’s Eventbrite integration allows you to set fundraising requirements for attendees, based on their ticket or registration type. 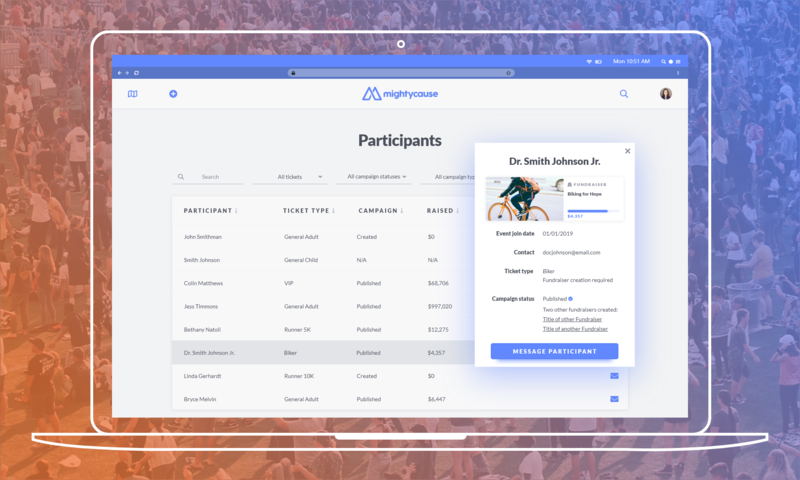 Our platform makes it easy for attendees to register, set up their fundraising page, and start fundraising in no time at all. Events can be huge sources of revenue for nonprofits. And with Mightycause’s new event registration, you can raise even more and offset your organization’s costs by selling tickets. Set Ticket Quantities: Create urgency to buy tickets early, and eliminate the worry about selling more tickets than your event can accommodate. Set Ticket Prices: Ticket prices are 100% in your control. Use ticket sales to supplement your fundraising efforts, or make them your main revenue source. Sell VIP tickets, reduced-price early bird tickets, and more! Choose an End Dates for Ticket Sales: Keep your event on track and get a reliable final head count! Choose when you’re like to stop ticket sales through Eventbrite. The ability to sell tickets means your event can engage more people, grow your event, and allow attendees to get involved in your event in the way they want. Ticket sales mean you can add complexity to your event, shake up your existing events, and explore new event fundraising options!